This week I felt a little stumped on which item to write about. There are THOUSANDS of items in our industry and sometimes it’s daunting to pick just one. 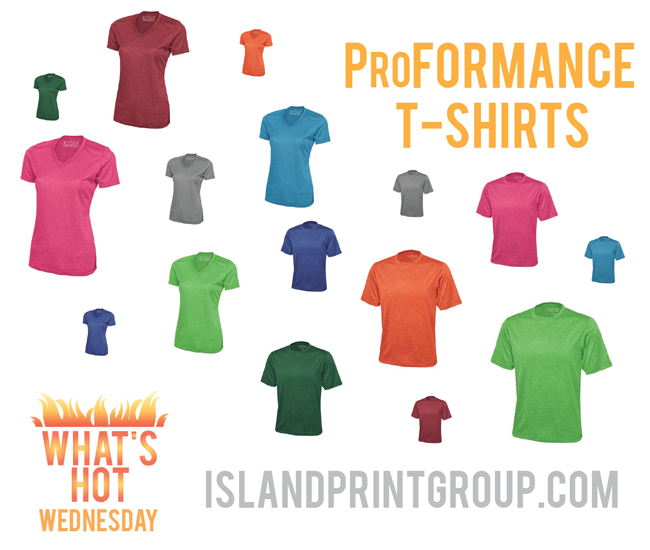 So, I asked for some input from Jarid (one of our amazing sales reps) and here is what he thinks is hot this Wednesday! Spring is when there are new styles released by the clothing suppliers. This spring did NOT disappoint! 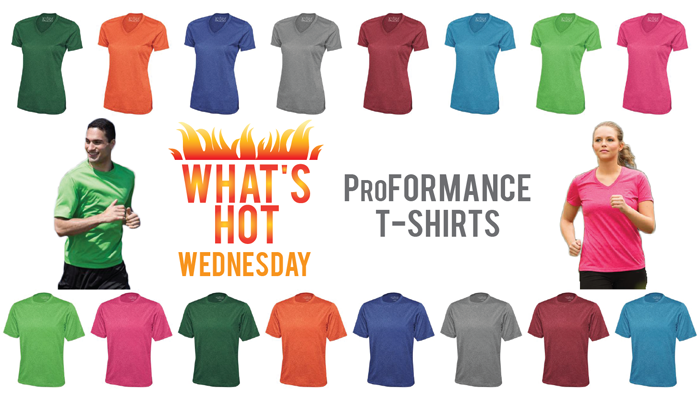 SanMar Canada and The Authentic T-Shirt Company released an amazing new shirt called the Pro Team ProFORMANCE Tee. It’s a 6oz, 100% polyester heather jersey knit tee and tagless. (Of course – because nobody wants those pesky tags at the back of your neck!) The amazing thing about this shirt, according to Jarid, is that it is a high quality tee (100% polyester!) at the same price as the regular cotton tees that wear out so fast. The fabric is moisture wicking. Yup, you read right. Unlike those cotton tees that seem to absorb every ounce of sweat you produce while you’re doing your job, these babies wick it away! It also comes in both men’s and ladies styles and the ladies style is ACTUALLY flattering, not blocky like the cotton style. (If you’re a lady, and you’ve worn those “ladies” cotton tees, you know exactly what I’m talking about!) After researching these t-shirts, I can see why Jarid thought of them right away! They come in EIGHT different colours, both the mens and ladies go up to size 4XL, and there is also a polo style shirt available! SanMar and The Authentic T-Shirt Company nailed it with this shirt. Which colour would you choose for yourself? Loving life & enjoying the opportunities of a positive outlook. My hobbies range from printing to promotional goods, YouTube to Twitter or from graphic design to music – I love it all! Most of all, I love helping people build their brand!